Venice, ah Venice.. One of my favorite cities in the world. Sure, I admit, it`s pretty touristic, and has become even a bit of a cliche of it`s self, but the uniqueness, and just pure beauty of the place is in a level, that it`s pretty hard not to become touristic. For me, as a history geek, it`s just a mesmerizing place to visit. One of those places in Europe where you can just get totally and beautifully lost, medieval style, and you don`t mind it. Just wandering through the empty, foggy streets and alleys of the Old Town at night, only hearing the echoes of your own footsteps, sounds of the water, maybe a laughter from a distant street; I almost started to see the shadows and shapes of La Bautas and Arlekhinos, disappearing into the night. In such moments one could start to hear the soul of Venice whispering, and telling stories of the ancient, glorious past..
After a sunny and warm day, there was a beautiful sunset hitting San Marco square, a tourist trap I would pretty much recommend avoiding after you`ve seen it (it`s beautiful don`t get me wrong). But, we decided with my travel companion that it would be nice to drink some good wine there, and enjoy the sunset. The problem though is that in San Marco square the restaurants are ridiculously pricey, boring, and with bad wine lists. So what to do? 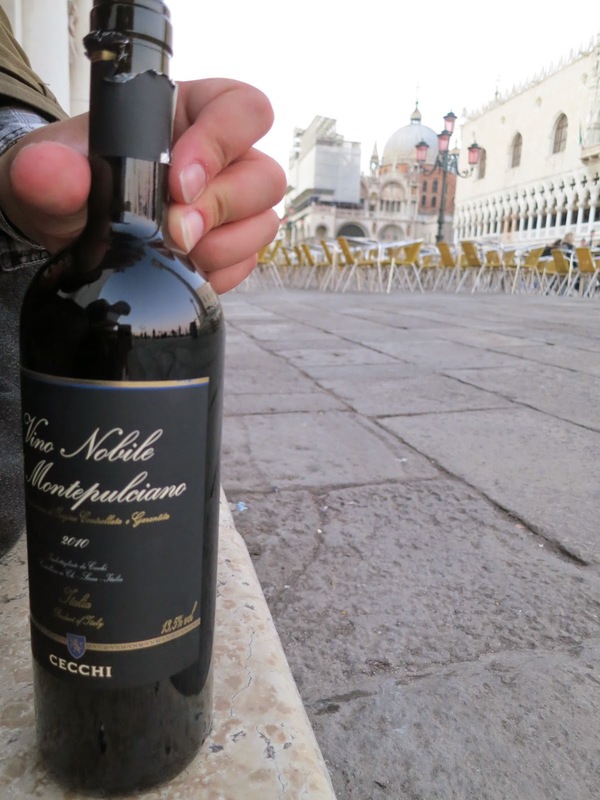 Go to a supermarket, buy a bottle of interesting wine, wine glasses, find a nice place to sit, with a good view; which we found just under the Lion of Venice.